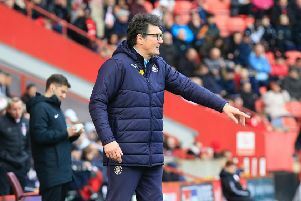 Luton boss John Still will wait until Saturday’s last pre-season game with Walsall to make to make a final decision on summer trialists Calvin Zola and Mustafa Tiryaki. The Hatters manager also gave the biggest hint yet that this weekend’s friendly would be the day that number one striker target Craig Mackail-Smith signs. The 31-year-old did not feature in the 2-1 win over Brentford on Tuesday, but was watching as Still once again ran the rule over two other options. However, in just his second game, Zola made the greater impact, replacing his fellow hopeful and smashing home the decider. New defenders Scott Cuthbert and Mark O’Brien both missed the Bees game with minor knocks, which are not thought to be serious, while Magnus Okuonghae played 90 minutes for the development squad in Tuesday’s 2-0 win over Hornchurch. Former Celtic ace Paddy McCourt has not featured for a week but is expected to get some game time against Walsall. While he’s signed ten new players to ensure his selections could see him reaching for the asprin, the return from injury of goalkeeper Mark Tyler will provide him with a new problem as Elliot Justham has established himself in the veteran’s absence since February. The 24-year-old former London Underground worker earned the man of the match award against Brentford for a string of fine saves and Still said: “Elliot has come on fantastically. He’s a young man that has come from a low level. I really felt for him last year. I thought he was good last year. “Unfortunately, and this isn’t a criticism, he came in at a time when we lost our two centre halves, Scotty Griffiths was having a problem and had to have an operation. We had no (Nathan) Doyle and (Jonathan) Smith and he came in at a difficult time but he grew up in that and we all think a lot of him here.